Crocheting Granny Square - Chart and Video. One of the fun things about Granny's is the wide varieties of designs you can create using the very same basic technique. Change type or color of yarn in each or some rows, size of hook, use different crochet stitches, embed additional motifs while crocheting Granny's and here they are. Large and small, dense and lacy, multicolored and plain. Like snowflakes, no two are alike. Even though the idea of making Granny Squares is as old as crochet itself, perhaps your grandmother wouldn't recognize Granny Square in some of their modern interpretations. Techniques of crocheting don't stay static. Old and well-known Granny Squares follow progress. They became stylish and fashionable. 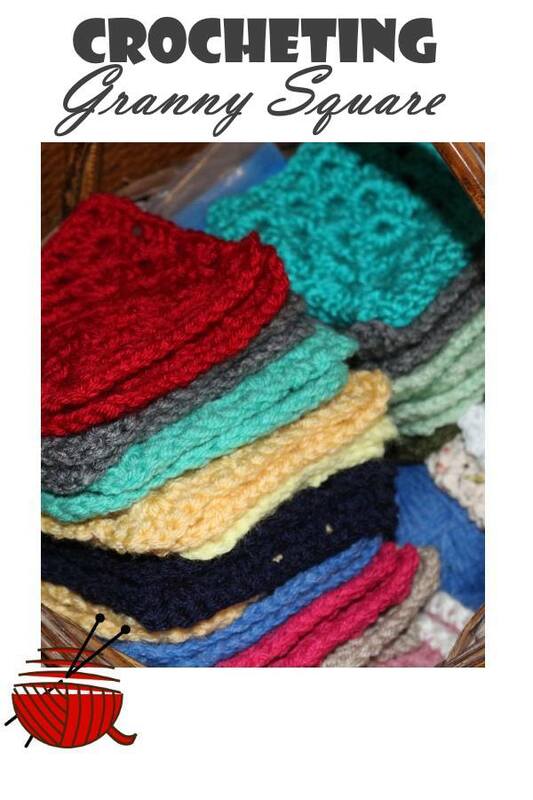 Nevertheless, to crochet most of them the same old method has to be used. We call it traditional crochet in rounds technique. A Granny Square, as any crocheting in rounds projects, begins from the chain connected into a ring by a slip stitch. It is a base for your first row. Number of stitches in each next row is greater than in the previous one. Every next row is going to have 8 more stitches than a previous one if you use single crochet stitches. In case your Granny's is crocheted with double crochet stitches, each next row will have 16 more stitches than a previous one. Rhythm of increases follows a Low of Circle. You can learn to crochet a simple circle or just to refresh your memory about this technique. Here is a chart for two rows of a Granny Square . It will let you idea about the process of crocheting Grannies shown in the videos presented on this page. Follow them step by step, learn the basics. 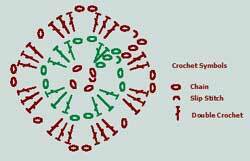 Depending on pattern you use to crochet Granny's, very often we have different combination of sc (or dc) and chains. Their total number in each row still has to follow Law of Circle which I mentioned above. Once you figure out the logic of their crocheting, you are ready for creating your own designs of stunning garments, which are based on Granny squares. Process of perfecting never ends. Step 2: First row forms a square. Step 5: Taking care of the tails.